Clerk (pronounced “Clark”) was his family’s original name, but his father added Maxwell as a second surname after the family inherited an estate from ancestors named Maxwell. James was an only child, born on June 13, 1831, in Edinburgh, Scotland. His mother died of abdominal cancer when he was only eight, and his father, with whom he developed a close relationship, raised him. By age 14 he had published his first scientific paper, describing how to draw geometric curves with the aid of pins and thread. His teacher at Cambridge University said that Maxwell was the most extraordinary student he had ever known, and that it seemed impossible for him to think wrongly on any physical subject. He taught in Scotland and England from 1860 until 1865, when he retired to his Scottish family estate. Maxwell tended to work on several projects at a time, often setting one aside and taking up another, to come back later to the first. In 1861 his interest in color and color vision culminated in the first color photograph, taken and projected through three separate color filters. By 1866 he had completed his important work on the physics of gases, proving for the first time that the velocities of molecules of a gas, previously assumed to be equal, had to be distributed in a particular statistical way. In 1871 Maxwell was elected the Cavendish Professor of Physics at Cambridge University. He designed and oversaw the construction of the famous laboratory there. His greatest work was in the theory of electromagnetism, which he laid out in a book published in 1873 called Treatise on Electricity and Magnetism. Many other scientists—MICHAEL FARADAY, CARL FRIEDRICH GAUSS, Hans Christian Oersted, and ANDRÉ AMPÉRE, to name a few—had made discoveries about electricity and magnetism. But no one could see how to put them all together, because one key piece was missing. Faraday had shown, in the year that Maxwell was born, that a changing magnetic field generates an electric field. Maxwell was able to demonstrate the converse, that a changing electric field generates a magnetic field. If an electric field can generate a magnetic field and a magnetic field can generate an electric field, then the sequence of changes can go on forever, generating electromagnetic waves. Maxwell showed that these waves traveled at exactly the speed of light; he was the first person to understand that light is a continual series of changes in electric and magnetic fields. During the spring of 1879 he became ill with abdominal cancer. He died of the disease on November 5 of that year, at age 48. He was buried in the small village of Parton, Scotland. Maxwell’s far ­reaching influence has had both theoretical and practical effects: it helped lay the groundwork for ALBERT EINSTEIN’s theory of relativity and provided a foundation for the whole array of contemporary communications technologies. Eight years after Maxwell’s death, Heinrich Hertz demonstrated that electromagnetic waves of the kind we now call radio waves could be created in a laboratory. Before long they were being transmitted across a lab, then through lab walls, and soon across oceans. Today, of course, the entire planet is brought closer together by radio and television waves, and on a more personal level, pagers and cordless and cellular phones extend the reach of these waves to anyone with the proper equipment. Maxwell’s discovery led directly to these innovations. Albert Einstein, born the year that Maxwell died, would use Maxwell’s work on electromagnetism in his work in the twentieth century. Maxwell’s theory about the constancy of the speed of light became a foundation for Einstein’s relativity theory. Maxwell’s ideas had applications in many disparate fields; his work touched on what has become information theory, cybernetics, fluid theory, and optics. The fish­eye lens, for example, came from his research. 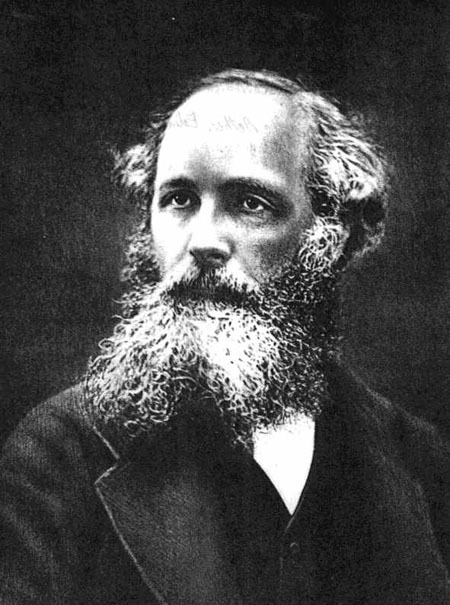 One concrete influence of Maxwell’s work is from the lab at Cambridge that he designed and supervised. It became one of the most fruitful laboratories in Europe, where countless discoveries in physics have since been made. Posted on March 9, 2015 by Natalie. This entry was posted in Scientists. Bookmark the permalink.